Falling iron ore prices and interest market dynamics tipped to keep AUD under pressure in 2018. The Australian Dollar was seen under pressure amidst a sharp fall in iron ore prices which is a key foreign exchange earner for the Aussie economy. Australia’s Dollar was seen in the red against the entire G10 basket Tuesday, with its steepest losses coming in the face of the US Dollar, which has regained the initiative now that lawmakers in Washington have voted to reopen the government. The AUD/USD was quoted at 0.7965 at the time of writing. 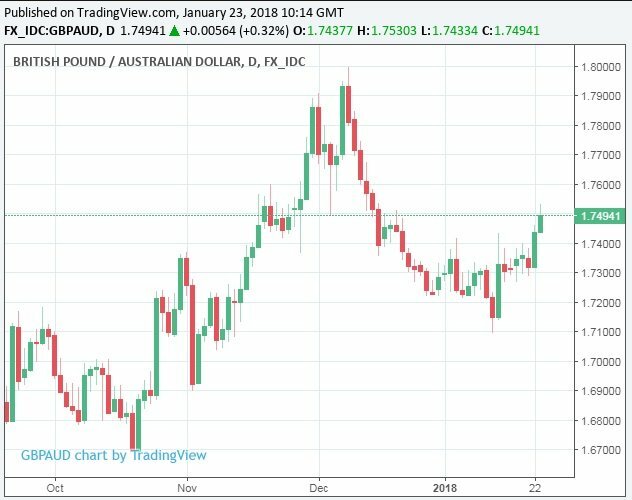 The Pound-to-Australian Dollar exchange rate was meanwhile quoted higher at 1.7518 with the move confirming the pair’s uptrend remains alive. “The AUD has its worst day in more than a month as investors were caught long as iron ore prices collapsed by over 4.5% at one stage during the session,” says Valentin Marinov, an analyst with Crédit Agricole. Iron ore prices dropped sharply to be quoted at $75.49 / tonne at the time of writing amidst a growing glut of supply on the global markets, of which Australian production is certainly contributing towards. “A channel of recent AUD support – rising iron ore prices – looks set to revert; our commodities team see the rally up to US$75/t as overdone now and expect a return to US$55/t by 2Q18,” says Viraj Patel, a strategist at ING Group, in a note Monday. Prices of iron ore, Australia’s largest export, are a constant source of risk for the Aussie Dollar. After undergoing a sharp fall during the summer months of 2017, prices have steadily higher ever since the beginning of October but this recovery now looks to be running out of steam. “An added headwind is the spectre of US steel tariffs – President Trump now has the Commerce Department’s Section 232 report and has 90 days to decide on recommended policy actions (the aluminium report will be released on Monday),” says Patel. Australia is the world’s largest exporter of iron ore and China is the largest buyer of it by a country mile, which means fluctuations in Chinese demand can have a significant impact on the Australian economy and its Dollar. Following years of allegations over alleged state subsidies, the US administration has launched several waves of trade defense measures aimed at Chinese and other steel producers, mostly leading to higher tariffs on imports. However, the US Commerce Secretary’s Section 232 report could seek to further restrict the entry of Chinese imports into the United States, this time on national security grounds. If the report recommends restrictions, it is hardly going to be a positive development for iron ore prices. The Chinese steel industry is already under pressure to consolidate due to overcapacity and the government’s forced closure of some production sites on environmental grounds. “Given that this could occur anytime, the unpredictability may act as a limiting factor for AUD bulls in the absence of any other major catalysts,” says Patel. Above: Pound-to-Australian-Dollar rate shown at weekly intervals. Tuesday’s moves snap a month long winning streak for the Australian Dollar, which has been egged on of late by a series of better than expected economic reports. “Despite a healthy Australian jobs report, positive Chinese GDP surprise and soft US dollar environment – AUD/USD has failed to make much headway above the 0.80 level,” Patel writes. After clocking up sizeable gains over a weak US Dollar during 2017 the AUD/USD rate is back at multi-year highs, even after Tuesday’s losses. Further gains from this point could be counterproductive for the currency as they would be likely to act as a counterweight to Australian inflation by making imported goods cheaper to buy. Given that Australian inflation remains below the midpoint of the Reserve Bank of Australia’s 1%-3% target range, further fluctuations that push the consumer price index lower would only encourage the RBA to become more vocal about currency strength. At the extreme end of the spectrum, a higher currency could mean markets face an even longer wait before the RBA becomes willing to raise interest rates. The Reserve Bank of Australia has held the official cash rate at a record low of 1.5% ever since August 2016. It has been content to hold rates where they are due to below-target inflation, weak wage growth and concerns that rising interest rates might tip some highly indebted Aussie households over the edge. With central banks in the US, Canada, the UK and Europe all expected the tighten or alter their monetary policy settings during 2018, while the RBA remains at a standstill, few strategists see the Australian Dollar posting a decent performance in year ahead. In fact, many are betting outright against the Australian currency this year. “Our AUD/CAD [sell] is predicated on two drivers of relative value – the expectation of trend rate divergence as BoC hikes quarterly and RBA stays on hold, and the expectation that oil prices outperform the broader commodity complex on OPEC supply management and a lagged US shale response,” says Paul Meggyesi, head of FX strategy at J.P. Morgan. The J.P. Morgan team are recommending that clients bet on a fall in the Australian Dollar against the Canadian Dollar because they expect the latter will benefit from higher oil prices later this year while the Australian Dollar is set to be clobbered by divergent global interest rates. Australian government bonds have traditionally paid a higher yield than that offered by other developed world bonds but, if the RBA remains on hold while other central bank raise rates in 2018, then this yield premium and support will shrink. It may even become negative. This would drive international money flows away from the Aussie Dollar, leading to downward pressure on exchange rates. “We continue to expect the RBA to remain on hold in the year ahead. This means that a negative policy rate spread between Australia and the US looks almost certain in 2018,” says Sally Auld, chief economist for Australia and New Zealand at J.P. Morgan, in a recent currency briefing.